Studienarbeit aus dem Jahr 2011 im Fachbereich Germanistik - Linguistik, Note: 1,3, Humboldt-Universität zu Berlin (Deutsche Sprache und Linguistik), Veranstaltung: Modus und Modalität, Sprache: Deutsch, Abstract: The topic of this paper is a special Hungarian morpheme '-hAt' with modal meanings. 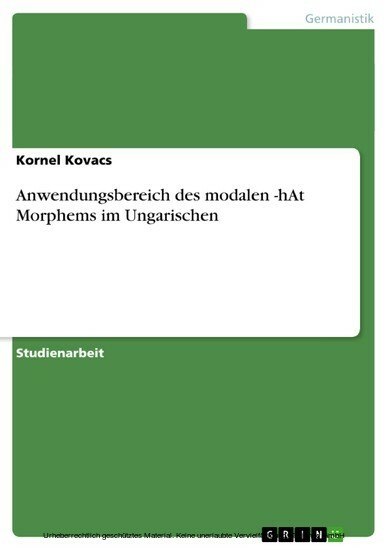 This morpheme is polyfunctional in its semantic and morphological characteristics, and that is why the Hungarian language is able to express different modal meanings (i.e. epistemic, buletic, dispositional). This paper shows all the semantic and morphological features of this morpheme.